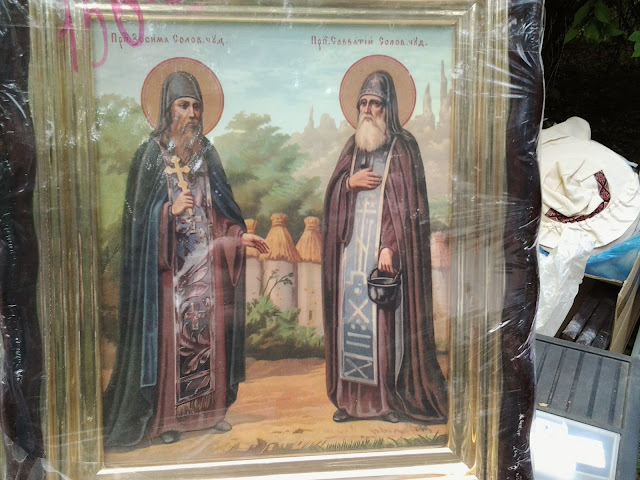 A Beekeeper's Blog: Ukrainian Beekeeping Saints; Protectors of Beekeeping? Ukrainian Beekeeping Saints; Protectors of Beekeeping? Ukrainian beekeepers apparently have two saints that are protectorates of bees and beekeepers. Here they are photographed on a field day to Barishivka. On the right I think carrying a honey pot is St. Ambrose, but he has another name in the eastern tradition. According to one source, "St. Savvaty and St. Zosima of the Solovetsky Islands became the Patron Saints, together with St. John the Baptist, of beekeepers in Ukraine and Russia. On the Feast of St Alexius the Man of God (March 30th), Ukrainian beekeepers would begin their chores by hanging small icons of Savvaty and Zosima in little shrines placed among their beehives, an event celebrated in one of the poems of the Ukrainian poet, Ivan Franko. "Beekeeping was and is so popular a form of agriculture that the Slavonic liturgical 'Book of Needs' or 'Trebnik' which contains blessings for many items has no less than four liturgical blessings of: New bees (called the 'voiceless ones'), new bee-hives and beekeepers, beekeeping implements and new honey and beeswax to be used in the making of Church candles. "These blessings were added to the Greek Trebnik by the early Metropolitans of Kyiv as a way to inculcate Christianity into the life of the newly baptized Ukrainian people. Honey itself was always considered a symbol of Divine Grace and this is why the Church service books often call Saints, like Basil the Great or John Chrysostom, 'Divine Bees' who produced the honey of excellent theology. Honey was often given as a popular gift on St Nicholas' Day to children, not only because it was sweet, but also as a symbol of the Divine Bee, St Nicholas Himself. My linguistic skills in Ukrainian failed to inform me about how the saints fared as protectors of beekeeping with coming of the mite Varroa destructor. It looks like the critter created as much havoc in Ukraine as elsewhere.